The Cassini Composite Infrared Spectrometer (CIRS) consists of two spectrometers (far-Infrared and mid-Infrared). 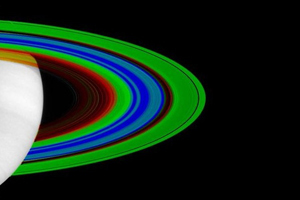 It measures the infrared energy from Saturn, its rings and its moons. CIRS observations of Saturn’s rings should determine the thermal structure of the the rings and provide insights into ring material composition and ring particle size. Calibrated CIRS data from the Saturn encounter is now available in two formats. See the About CIRS Data Tab for information about the formats. Cassini CIRS Data User Guide. May 2017. An updated version of the CIRS User Guide is available. The tabs associated with this page describe the CIRS data files and how to obtain and use them. About CIRS Data - Organization of the archive and links to key documents. Access Original Format Data - Links to the original data volumes (Jupiter and Saturn encounters).